We’re delighted to launch the programme for this year’s Sound Connections Challenging Circumstances Music Network Conference: Taking Off. 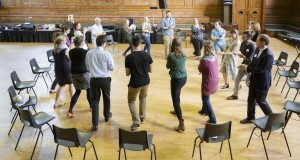 This one-day event takes place at the beautiful Cecil Sharp House in Camden, the home of Sound Connections partner organisation and conference supporter, the English Folk Dance and Song Society (EFDSS). It will showcase the findings of Taking Off, a Sound Connections research project aiming to map existing progression routes, and overcome barriers to progression, for young musicians in London facing challenging circumstances. Progression routes for London’s most vulnerable young people is something that people and organisations across the music education sector are tackling together. That’s why we’ve put together a conference timetable that’s for everyone, from practitioners to project deliverers, cultural organisations to classroom teachers. It will feature contributions from representatives from across the music education community including young people, specialist practitioners, academics and funders. There really is something for anyone and everyone interested in the field of music in challenging circumstances. We are thrilled to announce that this year’s keynote speech and opening activity will be delivered by the inspirational Stella Barnes, Director of Participation at Ovalhouse, who leads on an innovate programme of arts engagement and progression routes for young people in challenging circumstances, including a long-term Young Associates programme which is embedded throughout the work of the organisation. You can download an essay written by Stella about ethics in participatory arts with young refugees, ‘Drawing a Line’, here. Matt Griffiths, CEO of the National Foundation for Youth Music, will be chairing a discussion in the afternoon session which will feature five ‘provocations’ from a range of representatives from across the sector – young participant, experienced practitioner, classroom music teacher, and academic Gary Spruce, Senior Lecturer (PGCE Music) at The Open University. This will be an opportunity to hear a real mix of perspectives when it comes to discussing what inclusion really means in the context of making and delivering music in challenging settings. Breaking out into smaller discussion groups, you will be able to share your thoughts and feedback to delegates in tailored Solution Groups around each different perspective. Interactive workshops will feature throughout the day, shining the light on current ground-breaking practice and offering you new ideas and skills you can embed directly into your practice. Graham Dowdall, Sound Connections Associate Artist and Practitioner will be sharing some of his recent work with SEN/D young people in Redbridge, and we will be introducing our latest cohort of Innovate projects – a fund set up by Sound Connections which recognises original new work in the field of music in challenging circumstances. For those of you who are interested in submitting future applications to the Innovate fund, there will be one-to-one surgeries running throughout the afternoon session where you can meet a member of the team and discuss a potential proposal. The day will close with some dedicated networking time over a glass of wine – giving the opportunity to forge new collaborations and connections in what is often a disparate and isolated field, with the help of the Sound Connections team of course! Full day tickets are £85, half day tickets at £50 – if you can’t attend the whole day you can select if you would prefer to attend the morning or the afternoon session when booking online. Discounts are available for CCMN members, students and groups; email admin@sound-connections.org.uk for more details. See below for a preliminary schedule. Please note, this may be subject to change. 11:00 Taking Off presentation & activity: Fairbeats!